'Love must be sincere. Hate what is evil; cling to what is good. Be devoted to one another in brotherly love. Honor one another above yourselves" (Romans 12:9–10). 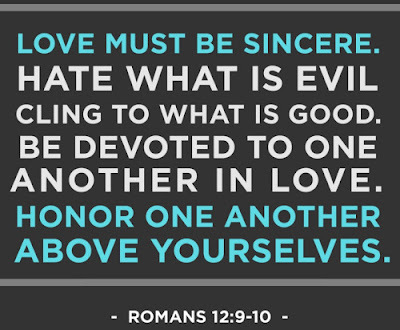 Another way to translate the first sentence of verse 9 is this: “Let love be without hypocrisy.” The Greek word for hypocrisy, a form of which is used here, means “playacting.” Our love for one another must not be a form of playacting, but must be genuine and authentic. Christians sometimes get a reputation for coming across as plastic and syrupy, because sometimes we get into a habit of using pious phrases that sound phony. People don’t want to hear cliches and jargon. What they want to see, and what they need to see, is real love and real concern. Paul follows up his command to love with a command to hate. We are to find evil things odious and to hate them. If we really love people, we will hate the evil that they do, which destroys them and those around them. Paul helps us to see what hating evil means when he writes, “cling to what is good.” The opposite of clinging is rejecting, hurling something far from us. We are to hurl away evil with all our might as we cling to what is good. Paul continues to expound this idea of “clinging” in verse 10: “Be devoted to one another in brotherly love.” What does it mean for me to be devoted to someone? It means to care about his well-being and to apply myself to his needs. It means sacrificing my comfort and privileges in order to help him. Practically, Paul writes: “Honor one another above yourselves.” Each of us loves to be honored, and there is nothing wrong with enjoying honors. We have a tendency, however, to be envious of the honors that come to others. Paul strikes at this vainglorious tendency and tells us that a practical test of our devotion to one another is whether we really rejoice when others are honored. Do you rejoice when others are honored, or do you find a hidden resentment in your heart when someone close to you receives high praise? Even more to the point, do you take delight in praising others? When was the last time you praised those close to you for a job well done? Establish a goal of affirming someone each day both in your workplace and home.